I got this yesterday, it's a nice little clock for the price. 2. Has a phone included. Clear away some clutter on your desk or nightstand with the all-in-one clock, radio, telephone, and caller-ID system from AT&T. 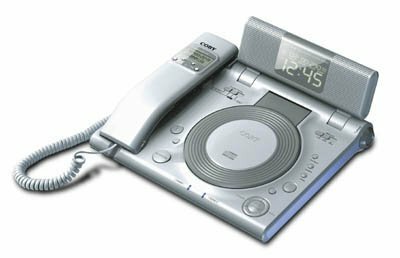 You can wake up to music, news, or a forceful alarm and place nighttime calls with the lighted handset. Setting up the 360 was easy--we just plugged in the AC adapter andtelephone cord. The backlit LCD display prompted us to set the clock, which we were able to do without the manual. We did glance at the manual before entering the caller ID settings, but the instructions were straightforward. Programming the memory dialing was almost intuitive. The process was a slight variation of AT&T's usual method of pressing the Prog button, dialing the number, pressing the Mem button, and then pressing one of the buttons to store the number. This time we had to press Prog again instead of the Mem button. Setting the clock-radio alarm was a little unusual. On the LCD screen, the radio is called Alarm A, and the buzzer is called Alarm B. (Why not Radio and Buzzer?) In our test, the telephone sounded clear and bright; the lighted handset worked on ordinary line voltage, requiring neither the AC adapter nor the battery; and even without the 9-volt battery, all settings were preserved without AC power for a few minutes. The caller-ID/call-waiting feature includes a bright indicator to let you know you have new caller ID entries in the history list or that a new call is coming in (if you're already on the phone). Phone receiver volume and clarity was poor.Display screen died after 1 year. Buttons too small, difficult to set, poor sound quality, not user friendly. I have not liked this unit since I bought it 18 months ago. The programming is not intuitive at all. Secondly, the snooze and alarm buttons are difficult to find if the unit is on the left side of the bed. Also, by the size of the display you'd think it would be easy to read. However I cannot see it from my bed--a foot away--let alone across the room. A black display with lighted letters/numerals would be better. Then yesterday I unplugged the phone as instructed to replace the 9V backup battery. When I plugged it back in, the light came on but there is no display. The radio won't work and neither will the alarm. All I have left is a phone. I bought this unit for the combination of features/price but I guess you get what you pay for! Looking for a gift for someone you dislike? Then, buy this.. If you ever wondered what became of engineering grads who were at the bottom of their class, Conair must be their primary recruiter. Don't buy stock in this company because their products are uniformly dreadful. I wish I had paid more attention to the other reviewers' comments before embroiling myself with this lousy clock telephone radio.The set looks pretty, but it is a disaster.Why? Nothing could be more ineptly designed. It used to be so simple to set the time.Not in this model.You have to go through multiple steps to set it, as though you were at the control panel of a jet aircraft. Why make such an easy function so complicated? The so-called backlit panel is a joke.They actually used DARK digits so that it is impossible to see the numbers! You need a magnifying glass (literally) to make out anything.To seethe display in a dark room, well, forget it.Also, the dim switch has no effect. The alleged lighted keypad is another joke. A few numbers in the center only are lit. So, to make a phone call when the room is dark, all the digits you are dialing need to be in the middle row if you expect it to be lit. Or, you need to develop braille sensitive fingers to feel your way around the keypad. or the alarm clock setting. So, in conclusion, if you are buying a clock radio to be able to use the phone at night, to select a radio station, or even, (heaven forbid!) tell the time, this is not for you. The only award it may ever win is for incredulity that any company would have the nerve to manufacture it. This is a very compact unit that does many functions adequately, but not perfectly. The caller ID works well, with a red blinking LED to let you know when there has been a new call. The sound quality from the radio is fair to poor, but then again this will probably not be used for high-fidelity sound. My main gripes with this unit are as follows: The LCD display is hard to view from across the room or at angles, the alarm time is a pain to reset- you have to go through a long menu just to reset your alarm time- this is hard to do in the dark without waking your sleeping significant other, and the button to turn the alarm on and off is tiny and hard to find when you're barely awake (although the snooze bar is nice and big), and the phone cord is on the short side. However if you are short of space on your night stand, this product will provide a degree of functionality. If you have the room, however, you'd probably be happier with a separate phone and a separate higher-quality clock/radio. Conair has a knack for making products that look like exactly what I want.This is what tricks me into buying them.However this is the 3rd Conair Phone product that I have purchased that just flat out didn't work when I took it out of the box.None of the buttons on the unit worked.I was unable to set the clock or do much of anything.Useless.Seek a more quality product elsewhere. Excellant product for the price! This is one of the best alarms I have ever owned.The light has two settings and on high it serves as a night light when I get up in the middle of the night.I also like the fact that it takes up so little space.No more needing two items.This is a great value for the money. 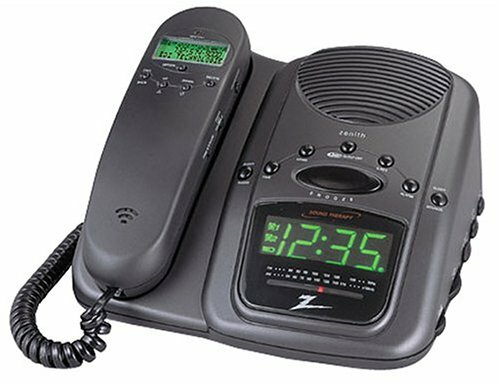 This is the worst telephone clock radio ever designed. The radio function has dreadful sound and does not stick to the station.It finally went dead after a year, taking with it the whole alarm system, and making it useless. The phone function is very difficult to use in the dark.The keypad is not lit and it is easy to misdial. When the equipment was removed from the box it stank of chemicals for several days, and a notice said that it would takeawhile for the smell to stop.Never bought a product before that had that problem. I agree with all the other negative comments in the other reviews except for the LED clock function. There is a switch that allows it to be bold or dim and the bold provides adequate lighting to see the time. However, don't buy this awful product. two died in less than a year!! 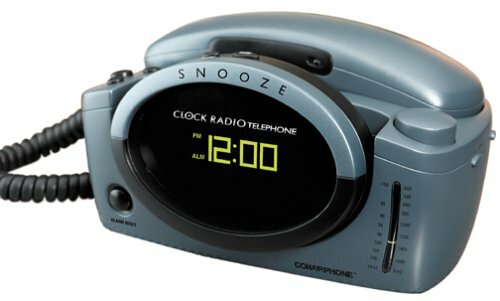 I purchased this phone/radio/clock combo for my mother and after the first few uses, it was returned. It's a good concept for those who have limited space, but poorly executed. The most glaring problem is that the radio will bleed into your calls. It isn't very loud, but you can hear talking and music very faintly in the background when the radio is supposed to be off. The radio reception itself is horrible and the speaker is not very good. There are buttons on each side of the phone that set various functions like volume control. Those were very loose and could probably snap off with ease after some use. The only thing good I can say about this is that the phone will work if the power goes out. Plugging it into an outlet is only needed for the radio, clock and caller ID functions. In fact, the phone works best if it's not plugged in; which seems to prevent the radio signal bleeding in. However, that goes against how this product is supposed to work. You're better off getting a lower priced corded phone and a separate clock/radio instead. 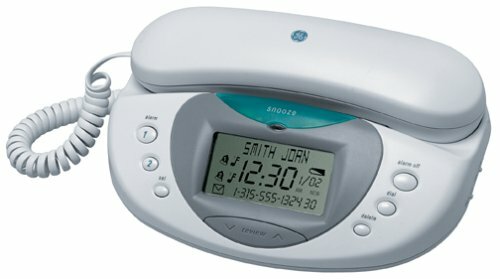 This product is the absolute pits.The audio is harsh and definitely unpleasant.When using the phone you can hear the radio in the handset even though the radio if off.As for the lighted radio dial........forget it.The dial has a narrow vertical slot through which a very dim LED lights.Since the dial markings are on either side of this slot, its impossible to see what station your trying to locate.Additionally, the caller ID display is also hard to see even if the contrast is adjusted to your liking.The brightness of the called ID display as depicted in the ad is misleading at best.Avoid this product at all costs.Believe me you won't be satisfied with it. You get less than what you pay for! Unfortunately, when I bought this phone, I got less than what I paid for... There are no bargains or good deals with this phone.. The radio is TOO loud when it comes on.The radio is hard to tuen. The clock face is too bright in the dark and the caller ID is hard to see.This is not a very good buy. Even on the dimmer of the two settings this clock's face generates enough light to read a book by. I found myself strategically positioning objects in front of it at night to block the insomnia-producing rays. Also the button lay out is very confusing. I still have to take a long look at it to figure out how to set the alarm time. Not an easy alarm clock to operate. When I first got this phone about 7 or 8 months ago, the only thing that bothered me was the FM tuning dial (antiquated/hard to tune in ANY station) and the clock display, even on low, was BRIGHT!Now, bit by bit the phone is falling apart.First off, it is advertised as a CALLER/ID/CALLWAITING ID (or at least mine was)..which it is NOT.It is ONLY Caller ID, if you are on the other line, there is no display of who is calling IN. Most of the time the Caller ID DOES NOT WORK AT ALL!As time goes by, caller id numbers pop up less and less...I'd say out of 10 calls coming in, it displayed only one.Next up, last week the radio started acting up.It can no longer be turned off!In other words, the alarm no longer works because on every setting (off/on/radio/alarm)the radio plays.All I can do is just turn the radio volume down and use it as a clock...and phone...no alarm, no caller ID...it's a piece of trash! UGGGHH!!!!! The only thing good about this phone is the voice quality which you get with ANY corded phone! 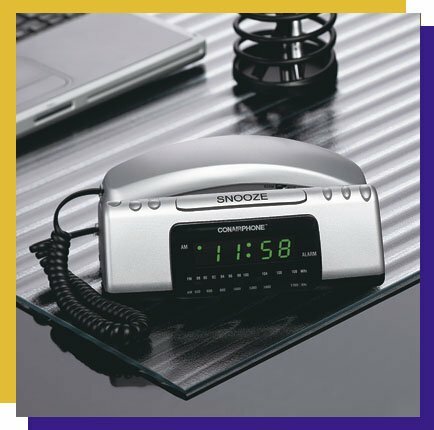 Clear away some clutter on your desk or nightstand with the all-in-one clock radio phone from GE. You can wake up to music, news, or a forceful alarm. Place nighttime calls with the lighted handset, and let the attractive art deco design accent your bedroom. 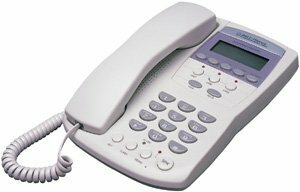 Setting up the phone on this attractive and durable unit was easy--we didn't have to consult the manual for any of the features. The AM antenna is built in, and the AC power cord also functions as the FM antenna. AM and FM stations sounded clear even in a basement room and were easy to tune in with the discreet tuning dial. The green LCD display seems very bright in a darkened room but makes it easy to find the phone to answer nighttime calls. If you're prone to swat the Snooze button when your alarm sounds, you'll find the big oval Snooze easily reachable. Just be careful not to hit the Hour or Min buttons, as these will change the clock time. Trying to discern the time or phone number at night or day in the prone position is virtually impossible due to the poor quality of the lighting display . Who wants to get up to read the time or phone number ?? Not me. Their products are full of glitches.This bedroom phone stopped displaying the Caller ID correctly the first time I bought it.After I brought it back to the store for a replacement, the time was always wrong.It would show the right time when a call came in, but would get stuck there until the next call.Look for similar statements about other GE phones and take the advice not to buy a GE phone. What a piece of garbage!! Great idea but a terrible phone.It's impossible to read exceptif you are directly above the phone.Also the delete for removing calls fromcaller id didn't consistantly work.The lcd screen was too bright and hard to read if lowered. I bought this phone about 2 years ago. Just after the warantee was up the handset quit working so that I could no longer dial out. Recently the ringer stopped working and one of the alarm buttons works only intermittently. The AM receiver has only ever worked to pick up a station about 15 miles from me that transmits at 64000 watts. Anything else on AM frequency comes in staticy (is that a word?). I absolutly love this item.Phone sounds great.Radio has excellent reception and sound.Caller IDclear and works everytime.Have had it for a while with absolutely NO problems.Recommend to everyone.Even gave several as Christmas gifts and ALL are pleased. The title says it all.We found the radio to sound pretty horrible as if the stations just could not be tuned well.The previous units (other brands) worked fine.Soon after, the caller ID stopped working.Then after almost a year, the phone stopped working.It's interesting how so few clock radio phones are available, and those that are seem to have low ratings. Must just be a faulty product.Too many people having the exact same problem.Like everyone else that wrote a review, I loved this phone/clock when I first got it.Then...the caller ID stopped working...then the handset.Alarm works wonderful is about all I can say for it. 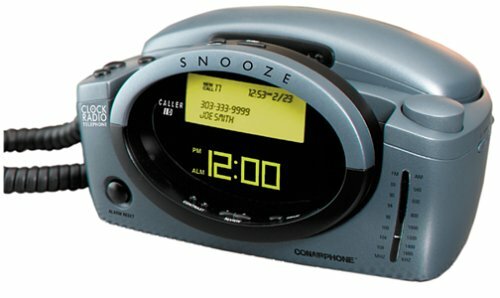 I used to really like this alarm clock/phone before I finally decided to subscribe to caller ID. I was all excited to see my first incoming call and when the call came, nothing happened. The caller ID display is totally blank. I went on the net to try to find out if I could get a owners manual, thinking I had done something wrong...Nope, I see here that others have had the same problem. The Zenith Z828 combines all the bedside functions you need in one unit. A multifunction CD player and AM/FM radio provide music through two 3-inch stereo speakers. A telephone with caller ID is also a part of the unit. 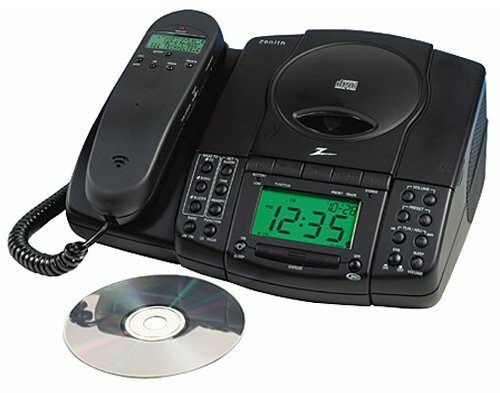 The Z828 offers the ability to wake to CD, AM/FM radio, or a buzzer. A battery backup for the alarm keeps your alarm from being reset in the case of a power outage. I have had this machine since early 2000.Everything works great when you read the instructions thoroughly.Great sound, nice alarm features such as wakeup to radio, CD, and buzzer.You can set all three alarms.When you turn off the alarm in the morning you do not have to worry about turning the alarm for the next day, as it will remember your settings.However, the problem with the phone not being able to dial out at times is a legitimate complaint.I called the manufacturer and they provided three tips that have worked but all are temporary fixes.If the phone stops working such as not being able to dial out or the caller id display is locked, first replace the 9 volt battery that is used for powering the features on the handset.Generally, this will fix the problem.If this does not fix the problem, the phone may also have been affected by a surge.Just unplug the cord that goes from the handset to the base of the phone and leave it disconnected for an hour or more.This should reset the handset.However, their may be ongoing problems where you may have too many phones on a phone line through out your house.Each phone has a REN (Ring Equivalence Number) on it.This phone shows 1.3 and is displayed on the black sticker on the handset.If the other phones simply stop working, check the total REN (Ring Equivalence Number) value of all the devices sharing your phone line. The total REN value on any one phone line should not exceed 4. If it does, some phones may not ring or even work at all, and computer modems will tend to drop the line or not connect properly. Most normal phones and computer modems have a REN of 1. If your other phones or PC modem is one of several devices on the same line and you have trouble, try removing one or more phones. Long extension phone cables can also cause similar problems and should only be used if absolutely necessary. The REN value is usually displayed on a sticker on the underside of the phone (eg, REN=1). With the phone annoyace I would have rated the phone 1 star if I didn't have the manufacturer's tips.If your phone does not have the problem, I would rate it a 5.Since I was able to use the tips with my phone problems, I rate it 3 stars. I liked the combo phone/alarm/cd but found the product to be the worst quality of any home electronics I have ever purchased.Both the original and the replacement lost keypad functionality within a month of use making it impossible to dial out.Also both phones slowly lost all contrast on the caller id lcd so that you couldn't make out any display after a couple of months. Almost sure to break within a few weeks of light use. I ordered this phone/clock radio and while the electronics seemed to work fine, the phone was dead and would never produce a dial tone, no matter what I changed or did. The reality of this model is it has poor CD sound quality, complicated controlls, a low ring setting thats still to loud, is physically bigger than the picture would have you believe and if you read the instruction manual before you purchased it, you would not purchase it.